All have 40 pony beads or more. I have many sets! Each bracelet has 32to 40 beads. All have 30 pony beads or more. I have many sets! The festival is observed by Hindus and Sikhs. This symbolizes the sister's love and prayers for her brother's well-being. Rakhi bracelet Indian traditional thread Raksha bandhan for Brother Sister. Raksha Bandhan, (the bond of protection) or Rakhi, is a festival primarily observed in India. 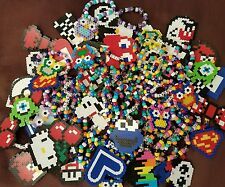 Stand out at your next rave/festival with these Perler Bead Kandi. You get 10 Bracelets (random selection). Spread the love! SB08 Glitter Pink Sapphire Acrylic Gemstones Beaded Motif Brooch Jewelry/Craft, this motif is made of shinny rhinestones, diamante and beaded, this is a shinny and chic piece, unique design, great for fashion dress, hairdress, shoes and craft. 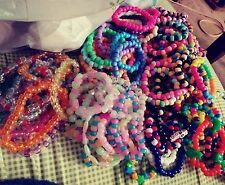 There will be a random selection of 50 different kandi in your order. I make worded ones and patterned. GRAB BAG STYLE. Everything is Random! All worded Kandi. There will be a random selection of 20 different kandi in your order. I make worded ones and patterned. GRAB BAG STYLE. Everything is Random! This item is a one of a kind handcrafted french beaded Sweet Pea stem. The blue bottle is for display purposes only and is not included. Original design by Minako Shimonagase. 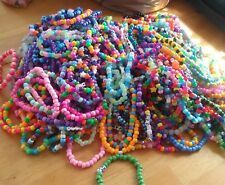 All have 28 to 30 beads or alittle more. All are hand made. I have many sets! Fringe 8" Belly Dance Hip Scarf Belt Chain Skirt And Bra. SANGRIA RED GARNET GEMSTONE GRADATED ROUND 11MM-5MM NECKLACE/LOOSE BEADS 17"
Drilled hole. Color, tone, and quality of these Garnet beads are well matched on strand. Sangria Red. Gemstone Type Garnet. Part Number 90107995-122 GARNET. 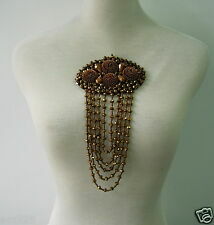 Type Necklace / Loose Beads. Beads Size Approx. Stand out at your next rave/festival with these Perler Bead Kandi. You get 3 Bracelets (random selection). Spread the love! This is one of my handmade french beaded flowers. These are my variation of 2 tone roses. This one is gray and it's tipped with turquoise. A veey dramatic end result that looks lovely! I can make a 2 tone rose in just about any color combination you want. 100 %NATURAL STONES. MONEY BACK GURANTEE. ACTUAL PHOTOGRAPHS OF ALLPRODUCTS. Santeria Yoruba. Pocket Elegua in a tiger cowrie shell. loadaded & consecrated. Elegua de Bolsillo /viajero. Eleguade Bolsillo. Pods are made with silver beads and outlined in gold. These are great in a bouquet and are wonderful as a filler for larger bouquets. All Beads are glass and I use colored non tarnish wire to match the beads. All have 28 to 36 beads or alittle more. All are hand made. I have many sets! 60 kandi bracelets with whales, seals, lions, and more! I also do custom orders! These flowers look very beautiful! Vase is not included! Color:White Flower with Green Stem. Stem Length: 6". Leaf: 1" wide x 2.75" long. Flower:10 Flowers, 2 Leaves. COLLAR DE MASO PARA SOPERA DE ORULA ORUNMILA TUREEN ELEKE ORU001MZ. Bouquet: 20 Stems, 5 Stems of Leaves. Stem Length: Up to 4.0" to 4.5". Stems are not beaded. Color:Yellow F lower. Made from natural very rare Pandanus Odorifer Fragrant Screwpine Seed. Type: Bracelet. Beads: 14 pcs.